Instructions: The finished card measures 6 x 4-3/5". For the base of the card cut white cardstock 12 x 4-3/5", score at 6 from the longest side and fold. Choose pattern paper from the collection, cut it to size 1/4 inch smaller than the card base and adhere with clear drying glue. For the second layer cut pattern paper 3-3/4 x 5-1/2" and adhere on top of first layer with 3D foam tape. Next die cut white cardstock using the dies from Lacy Diamond Die set. Ink the largest and second largest die cut out with Color box ink Olive Pastel. Also die cut out white cardstock using second largest die from the Eyelet Diamond Die. Layer the cut outs with 3D foam tape and arrange them as shown. Stamp white cardstock with flower pot and fillers image using Tulip Vase & Fillers Cling Stamp Set with color box ink Concord, and Archival ink Sepia. Also stamp white cardstock with tulip flower images using Tulip Bouquet Cling Stamp Set with Archival ink Sepia. Die cut the images using coordinating dies and color them with pencil colors. For creating the tulip flowers - stamp white cardstock with petal and leaves images using Tulip Time Cling Stamp Set with Archival ink Plum and Archival ink Library Green. Die cut images using coordinating dies. Color the petals from both sides using Archival ink Buttercup in the center and Archival ink Cactus Flower towards outside. For leaves use Archival ink Olive, Library Green and Color box Ink - Olive Pastel. 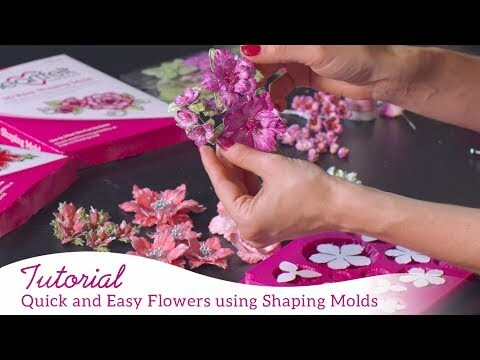 Shape the flowers using 3D Tulip Shaping Mold. 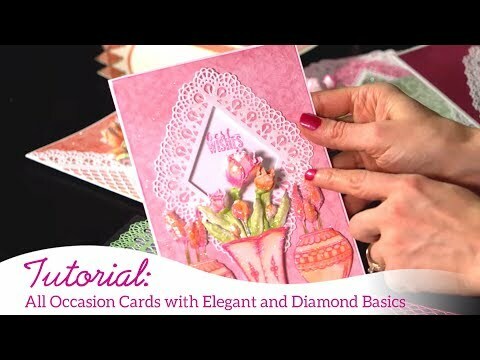 Arrange the flowers as a bunch in the upper left corner of the card with clear drying glue. Arrange the flower pot in the opposite corner with 3D foam tape and fill in with stamped tulip flowers as shown. Finish off with a sentiment cut out from the paper collection. Apply Glitter on flowers with clear drying glue.